Yesterday I attended the second day of the ‘Visions of Enchantment’ conference in Cambridge, organised by the University’s Department of History of Art and other sponsors. Unfortunately I was not able to attend the first day, which featured keynote lectures by Professors M. E. Warlick and Emile Savage-Smith. I would have been particularly interested in hearing Dr Christiane Hille’s paper on the esoteric symbolism of Elizabethan miniatures. Unfortunately I also missed more keynotes lectures at the start of today, by Dr Marco Pasi and Dr S. V. Turner. However, I arrived in Cambridge at lunchtime in readiness to deliver my own paper, ‘Esoteric Recusancy in the Elizabethan Age: The Occult Architecture of Sir Thomas Tresham’ as part of the panel on ‘Occultism and Architecture’ convened by Prof. Deborah Howard, Cambridge’s Professor of Architectural History. I shared the panel with papers on William Lethaby, the late nineteenth-century esoteric architect, mystical motifs on Javanese mosques, and nineteenth-century Spiritualist architecture in America. Overall, looking at the programme of the conference, the early modern period was rather underrepresented. The subject of my own paper was the esoteric influences on the architecture of Sir Thomas Tresham, most notably the knowledge of the Christian Cabala that he incorporated into his designs for the Long Gallery in the Bishop’s Palace at Ely and the building and grounds at Lyveden. 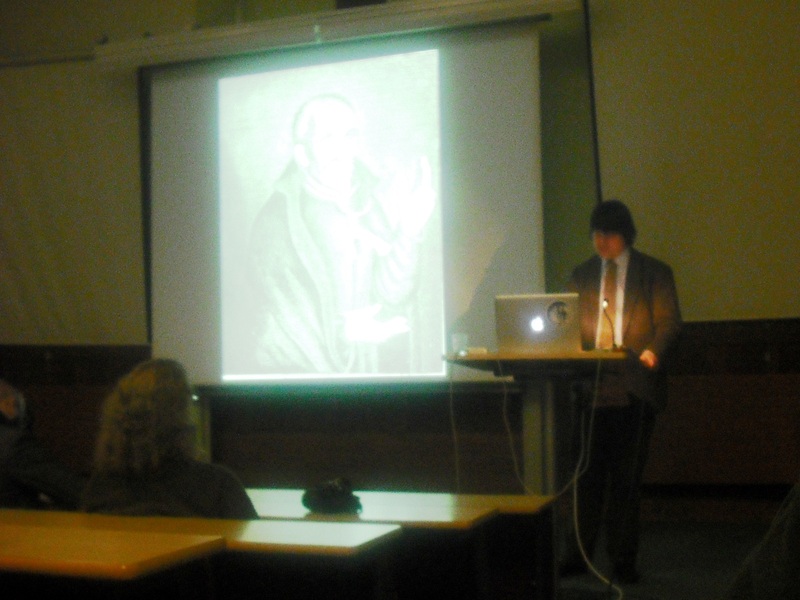 I was glad that Coral Stoakes was able to be there, and she was kind enough to take a photo of me during my paper. Tresham seemed to be a new figure to most members of the audience, so I was glad that I had included some basic background on him and his buildings. I was also surprised that there were so many similarities between Tresham’s choice of motifs and those of William Lethaby in the 1880s, as Amandeep Sangha outlined. 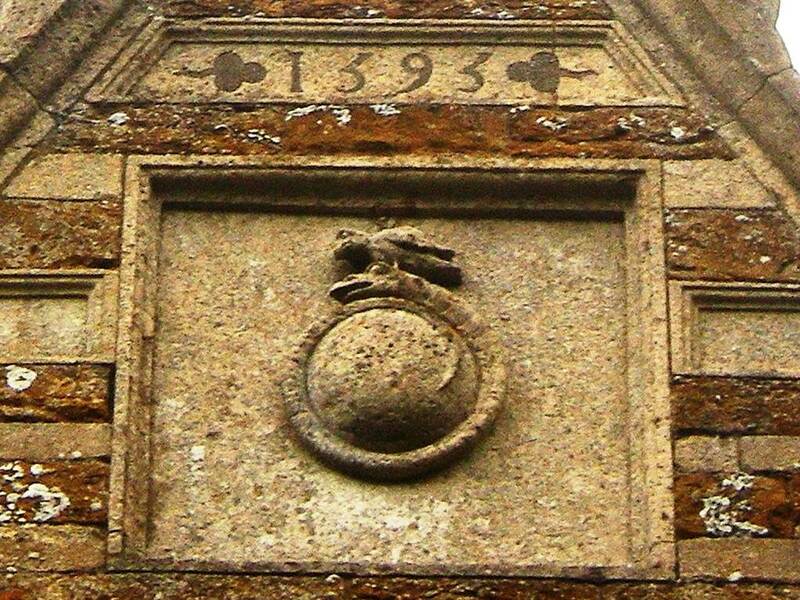 Like Tresham, Lethaby was preoccupied with the Tau cross and the serpent, as well as the connection between the cross and the ‘serpent lifted up in the wilderness’. Afterwards I was delighted to meet Dr Emily Mitchell, Senior Lecturer in Illustration at Norwich University of the Arts, who is currently engaged in a project exploring the history of witches in Norfolk, so I was able to tell her about my work on the history of witchcraft in the Ely area. I then attended the final keynote lecture of the conference by Professor Antoine Faivre, introduced by Professor Wouter Hanegraaf. Although illustrations in the works of eighteenth-century German theosophers is not really my cup of tea, I enjoyed this stimulating lecture from one of the founders of the field of Western Esotericism as an academic study. ‘Visions of Enchantment’ was an excellent conference that brought together specialists from a very wide range of disciplines, and thanks must go to Dan Zamani for organising the conference so smoothly and effectively. This entry was posted on March 19, 2014 by jacobite.